Conestoga Insurance - Property and Casualty students Ivy Tang and Luke Upfold were presented with $1,500 scholarships from the John E. Lowes Education Fund at a breakfast event held at the National Club in Toronto on November 13. 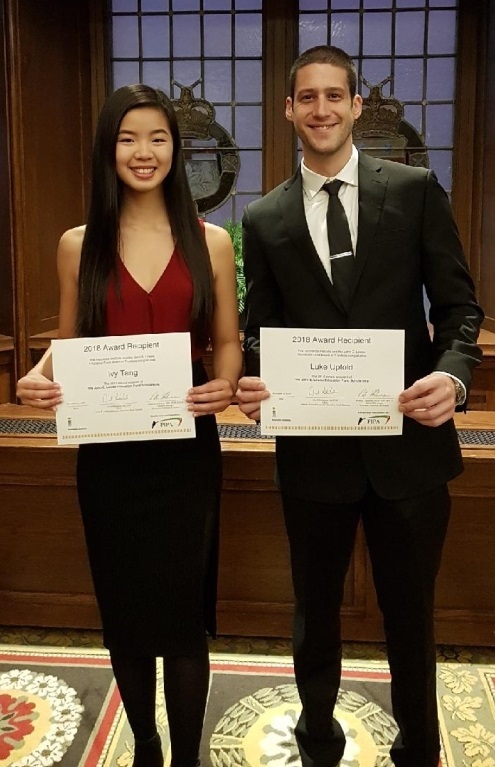 Insurance students Ivy Tang and Luke Upfold were presented with scholarships from the John E. Lowes Education Fund at a breakfast event at the National Club in Toronto on November 13. Established in 1993 in memory of Lowes, past chairman of the Insurance Institute of Canada and past chairman of the Insurance Institute of Ontario, the Fund is a charitable trust dedicated to offering four annual scholarships to full-time post-secondary students studying property and casualty insurance. At least two Conestoga students have been named recipients of the scholarship annually for the last seven years, and Upfold said that has a lot to do with the program’s instructors. Tang said student networking opportunities also support skills development. “We are fortunate to have invitations to networking events as well as visits to insurance companies such as Gore Mutual and Staebler Insurance,” said Tang. “These events add another layer to our learning experience and allow us to connect class material with real scenarios while we learn from professionals that work specifically in the career that we’re pursuing." Tang said the insurance industry is full of opportunity, but at the moment plans to become a full-time underwriter after graduation and advance her career from there. The Insurance Institute of Canada, established in 1899, sets professional standards for the industry through education programs that lead to a range of designations and certificates, including the internationally recognized Chartered Insurance Professional (CIP) and Fellow Chartered Insurance Professional (FCIP). Students in Conestoga’s two-year Insurance - Property and Casualty program receive broad exposure to business practices with a specialization in insurance for graduates who wish to be employed by the insurance industry. The program includes studies of all areas of property and casualty coverage considering agency claims, underwriting, marketing, and management. Students have the opportunity to gain nine of the ten credits required for the CIP designation from the Insurance Institute of Canada and may choose to register for the CIP national exams at an additional cost in order to receive credentials awarded by the Institute.